P.J. Bechtel, Muscle Development and Contractile Proteins. M.L. Greaser, Conversion of Muscle to Meat. A.M. Pearson, Physical and Biochemical Changes Occurring in Muscle during Storage and Preservation. R. Hamm, Functional Properties of the Myofibrillar System and Their Measurements. G.R. Schmidt, Processing and Fabrication. A.A. Kraft, Meat Microbiology. H.R. Cross, P.R. Durland, and S.C. Seideman, Sensory Qualities of Meat. C.E. Bodwell and B. Anderson, Nutritional Composition and Value of Meat and Meat Products. P.B. Addis, Muscle as Food. W.D. Brown, Fish Muscle as Food. Index. Emphasizing the properties of meat proteins, this volume has a broad-based examination of the factors that affect the process of converting muscle to meat. 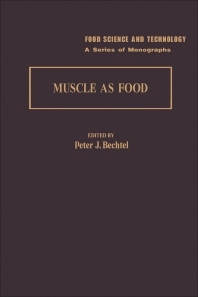 Unlike some books dealing with this subject, _p_Muscle as Food provides two complete chapters on the unique properties of poultry and fish muscle. Among the topics covered are: properties of the contractile proteins biochemical and physical changes during the conversion process changes occuring during storage and preservation functional properties of the myofibrillar system sensory and nutritional composition. This volume is a valuable teaching tool and reference source for students and researchers in the food, meat, and animal sciences. Researchers and students in food science and animal science.